Major General Mohammad Abdur Rab is a great warrior in our Liberation War. He breathed his last on 14 November, 1975 at the Combined Military Hospital in the capital at the age of 56. He had been suffering from different ailments including anemia. He was laid to rest at his village of Umednagar on the banks of Khowai River in Habiganj. The name of this man, who served as the chief of staff in the war is fast erasing from the people's memory. Looking at the very simple grave of General Abdur Rab, no one could guess that lying there was the first Chief of Staff of the Bangladesh Army and the closest aide of General MAG Osmani during the liberation war. General Rab was born at village of Khagaura under Baniachang thana of Habiganj in 1919. A lifelong bachelor, he once was also elected as lawmaker from the Jatiya Sangsad constituency comprising of Baniachang and Ajmiriganj thanas. 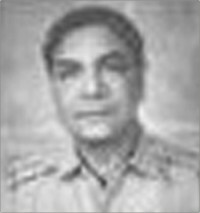 Rab was made Chief of Staff of the Bangladesh Army in April 1971 at the very inception of the force. He served as the prime aide to the Chief of Army Gen Osmani. Rab sustained serious wounds when shots from machine guns were fired on the helicopter carrying General Osmani and General Rab, just hours ahead of the surrender of Pak army on 16 December of 1971 in Dhaka. However, Osmani and his companions miraculously survived, but could not join the surrender function in the capital on that very historic day. This is considered to be one of the mysterious events of our liberation war history. The valiant fighter MA Rab was honoured with the 'Bir Uttam' award for discharging duties braving all hurdles in the most critical situations of the nation during the war of liberation. He served as chief of staff of the Army till 7 April of 1972. MA Rab was however, honoured with the rank of Major General. This sincere and extraordinary man just after the country's independence gave a laudable service in organising the Muktijoddha Kalyan Trust and running it successfully for years. He ran the organisation successfully for years at the very beginning.